With the imminent arrival of summer and the increasing temperatures that it will bring, families across America are planning their vacations with zestful anticipation. For some, vacation means a lengthy, leisurely escape to some far-off destination; for others, it can simply be a break from ordinary life, if only for an afternoon. So what might some do when they already live in an area that millions of people shell out lots of money to visit ever year? Why not make the most of it—whether that means hitting the famous white sands and emerald-green waters of world-famous beaches or choosing to stay closer to home and lounge poolside. If you’re like many people, the lure of the beach is sometimes outweighed by the hassle of finding sand in crevices you never knew you had. In that case, a crystal clear pool is probably more your style. 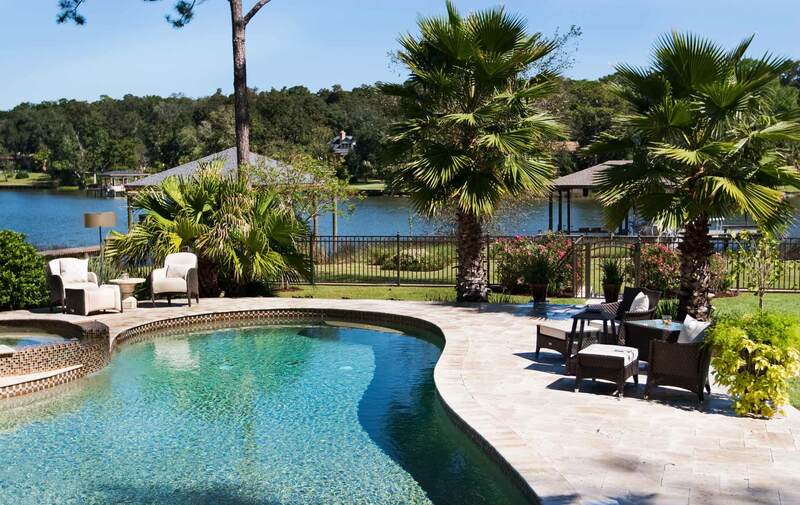 As Vince and Shawna Fisher of Aqua Pool and Patio can testify, living in a coastal area does nothing to diminish the appeal or luxury of that old summer standby––the swimming pool. As with many things in recent years, pools are being given fresh life as newer, more updated products and concepts are introduced. Backyard pools are no longer simple, but instead are works of art––beautiful additions to homes, offering visual interest to even the most mundane of spaces. Merely installing a pool is a thing of the past; now they are designed, customized, and specialized. Pools and patios have become oases and places to escape—experiences unto themselves. They offer fun for people of all ages, from the smallest splashers to the most seasoned swimmers. As a company more than sixty years old, Aqua Pool and Patio has gained a reputation for exceptional quality and attention to detail, as well as friendly and dependable service. When Jerome Schwartz began his business in 1949, it was called Jerry Lee Chemical Company and was simply a chemical and bleach company. Over the next few decades, sons Jerry and David took over and it evolved into a pool and patio company and became known as Aqua Pool and Patio. When the Fishers bought it in 2006, they knew they could take it even further because of the great reputation the company already had. The outdoor furniture product lines are only the beginning. In fact, the Fishers are well on their way to working from the outside in. Five lines of outdoor furniture now share space with full lines of indoor furniture; indoor and outdoor upholstery, accessories, and lighting; barbecue items; draperies and rugs; and even jewelry, and skin and body care. They are well on their way to becoming a company that focuses on the home as a whole—more of a lifestyle brand than simply the pool service provider that it once was. A major player in implementing that plan is Liz Taylor, their marketing director and resident interior designer, who was brought on staff last spring. Taylor’s primary function has been to develop this newly launched branch of their identity with their existing showroom and a new five-thousand-square-foot showroom on 9th Avenue in Pensacola under the name Aqua Decor and Design, which will be open by the end of October. The showroom space at their Palafox Street location will largely be occupied by outdoor furniture, neatly edging out the chemicals and pool supplies that one might expect to find upon walking through the doors of a pool and spa store. They will also begin offering interior design services for homes and condos. One can only imagine. But the couple applies their eye for detail and standard of service to all the pools under their care, and they demand the same of their employees. “Our customers rely on that. We say that we’ll be there, and we’re there. That level of service is what makes us successful,” says Shawna. Their level of expertise also plays into their success as a company. In fact, when considering the installation of a pool or even simply trying to establish a maintenance plan, Aqua is ideal. “Think about what kind of pool you want to get, and then work with a company that specializes in that type of pool,” Shawna advises. “Get three estimates and check with the Better Business Bureau,” she continues. Apt words, whether used in reference to pools or to life. Balance maintains longevity, and as Aqua Pool and Patio faces expansion to target both indoor and outdoor life, they’ll have to learn that balance all over again. For more information about Aqua Pool and Patio, please visit their website, www.aquapoolandpatio.com, or call them at (850) 862-9414. Look for the opening of Aqua Decor and Design at 1320 North 9th Avenue in October 2012.